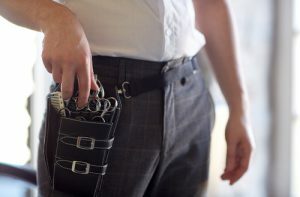 Home > Blog > Yippee, an English-speaking hairdresser in Sens! Hairdresser woes and discoveries might not sound too important to some reading this blog, but for those of us who live here or those who have been travelling by motorhome through non-English speaking countries for some months, an English-speaking stylist is a revelation! It doesn’t matter how well you studied French before coming to France, some professions simply have an unfathomable vocabulary that has never been written down or translated, so it’s not possible to learn. Hairdressing is one of those professions, and words like “choppy cut”, “highlights” and even “it looks a bit flat”, just cannot be translated successfully by Google or from a phrase book. So I am delighted to present my new discovery: “Frédéric B” of Sens. Frédéric, who has spent two years working in the UK, speaks English! 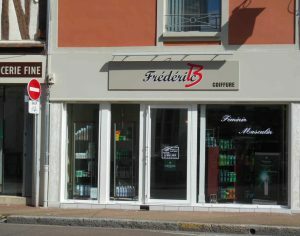 This stylish, busy little salon right in the city centre (and a short walk from the designated parking area for motorhomes) is reassuringly expensive, and Frédéric is on hand to overcome the language barrier. Now my hair is no longer a grim shade of orange with a cut from the 1980’s. I will be having a new photo taken (the one below is pre-haircut!) to accompany my blogs on the next sunny day. Those on longer term campervan trips, rejoice, good hair days are back on the horizon and we even provide hairdryers in all of our campervans to make sure you can replicate that great new “do” wherever you go next. ← Our “Prestige” vehicles are arriving thick and fast!